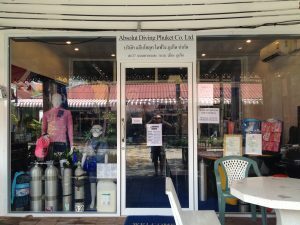 Welcome to Absolut Diving Ph uket, one of Phukets finest diving centers, located just of Kata Beach. Since the beginning, we have been committed to providing the highest level in scuba diving and technical diving by combining high standards in education and safety. We conduct all classes with our students in a comfortable and fun atmosphere. Absolut Diving Phuket offers everything from the basic Open Water course to Assistant Instructor, Specialty certifications and technical diving. For those individuals who wish to pursue the professional opportunities of scuba diving, our experienced instructors and Staff instructors will guide you through it. We also offer a year-round diving and snorkeling day trips, Liveaboard Safaris and private charter to the best dive spots of the Andaman Sea and beyond. Furthermore we offer Air, Nitrox, and Trimix fills as well as sofnolime and 100% Oxygen for CCR divers. We can provide a top-of-the-line Repair/Service for all major brands. Our professionally trained staff is knowledgeable and available to help you plan all your equipment purchases and your next adventure. We at Absolut Diving Phuket will take you to the best dive sites the Andaman Sea has to offer – at our local reef at Kata beach, the islands around Phuket or up north to the Similans and Burma. The warm and clear water offers pristine diving almost every day of the year and we are happy to accompany you on your first diving steps or any other dive.